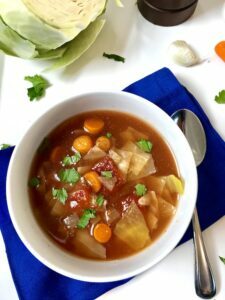 This Detox Cabbage Soup is really easy, low-calorie, veggie-packed, which is a great way to kick off a system cleanse! This soup is light, but filling with cabbage, tomato, carrots, onion, and garlic. It is also so easy because it is made in the slow cooker, but you can make it faster on the stove as well. It is so good for you and so low calorie, that this makes a great dinner, lunch the next day, and snack whenever you get hungry! Every so often, your body needs a detox, a chance to rid itself of the toxins that we may be consuming. We all do it, no matter how hard we try to eat well. Whether we grab something on the go or eat a quick lunch at our desk or the catered lunch for a meeting, or the appetizers at a party, we sometimes cannot help but eat foods that make us feel tired or less energetic. Or perhaps you have gained a few pounds after the holidays (I know that I have!). When you feel like this, perhaps it’s time for a detox. A detox is a focused diet that gives your body a break from food toxins, high sugar/fat/calorie foods, processed or refined sugar foods. Why Cabbage is so Great! 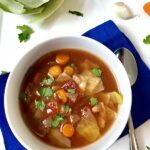 This Detox Cabbage Soup is a great recipe to give you a detox kick start. I promise, cabbage can be and IS soooo delicious in this recipes and it is incredibly healthy with so many benefits. Cabbage is a cruciferous vegetable, like kale and broccoli. We all know the health benefits of kale and broccoli, but cabbage is often overlooked and packs quite a punch in the health benefit department. Also, you can get a large 3lb head of cabbage that can contribute to several meals for not alot of money, so it’s a win, win, win! In terms of the health benefits…first, cabbage has antioxidants, which help stop or delay damage to cells. It is an excellent source of vitamin C and a good source of manganese, both of which act as antioxidants. Cabbage also provides anti-inflammatory benefits and is a great source of fiber, providing digestive tract support. Detox Cabbage Soup starts with cabbage, 5 Cups of Cabbage! 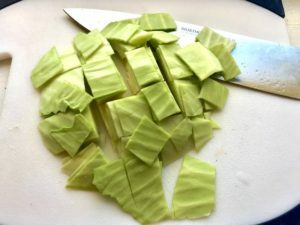 Chop it into bite-size pieces. 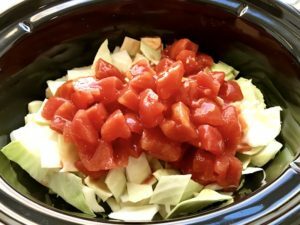 Add the cabbage and the rest of the ingredients to your slow cooker and cook for 8 hours. If you need to cook it faster, you can also cook it on high for 4 hours. That’s it! So simple, so good for you! Enjoy! 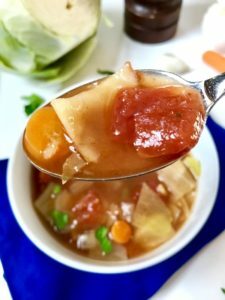 This Detox Cabbage Soup is a really easy, surprisingly filling, low-calorie, veggie-packed recipe that is a great way to kick off your system cleanse! The soup is light, but filling with cabbage, tomato, carrots, onion, and garlic. This recipe is made in the slow cooker, but you can make it faster on the stove as well. 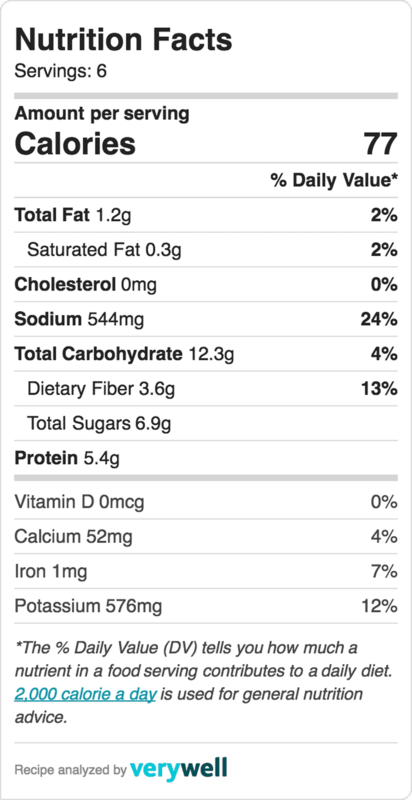 It is so good for you and so low calorie, that this makes a great dinner, lunch the next day, and snack whenever you get hungry! Chop the cabbage into 1 inch pieces. 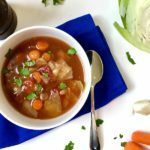 If there is leftover cabbage from the Golumpki, Stuffed Cabbage Rolls, then start by using that up in this soup. Then move on to the second cabbage head if needed to get to 5 cups of chopped cabbage. 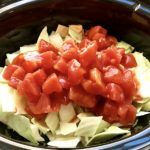 Add all cabbage to the Slow Cooker pot. Dice the onion and carrot. Mince the garlic. Add all ingredients to the pot with the cabbage: onion, carrot, garlic, can of diced tomatoes, tomato paste, vegetable broth, cayenne pepper (optional), salt and pepper to taste. Add 1-2 cups water, enough to completely cover all of the ingredients or to fill to the top of the pot. Set the slow cooker to whatever time frame suits you best. Cook on high for 4 hours or up to 8 hours depending on your schedule. If you cook it only for 4 hours, test the cabbage and carrots to make sure they are cooked enough. < Previous A Recent Pinterest Convert – I love it!